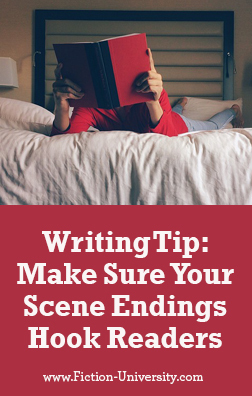 Look at the ending of your scenes and chapters. Do they end with something to keep readers reading? Not just the last line, but the situation or need in the novel itself? Is there something going on readers want to see? Need to know? Must read the outcome for? 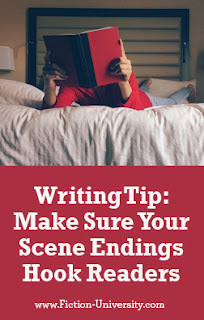 Don’t Know How to End Your Scene? Here’s Why. Having just finished the first five scenes of my first novel, I found after reading the above my second scene didn't quite serve the scene that followed. Ha! Thanks for that! But this leads to a question: during the writing process, what overall review process AND HOW OFTEN do you recommend in terms of reviewing work in progress, scenes of course, but everything else like plot and character? Earlier in the year I purchased your plotting book which became instrumental to getting my plot ideas in order. For a newb it was an eye opener. It prompted me to pick up your Revising Your Novel book, as I figured there was so much craft that I DIDN'T know that I needed a road map to review. For me, I figured every 10 scenes I should stop, go back over the work, and methodically line edit, look at grammer, dialogue, etc. Eventually I'll find my own process but for now some informed opinions are welcome. As often as you need or want. If every 10 scenes feels good to you, stick with that, or adjust is as needed. I tend to write in three-chapter chunks, and focus on one act at a time until I like how it all works. Other writers have different processes. Try multiple things and you'll find the one that works best for you.